Max and Hercules have a complicated relationship. I mean, what couple doesn’t, huh? But today, they seemed unusually tetchy with one another. The peevishness seemed to arise from some disagreement regarding who got to perch on the Monadnock ledge. Hercules perched there as I arrived. About 12 minutes later, Max flew in from the east carrying a portion of pigeon. Hercules called to him as he passed, but didn’t move as he landed on the nest ledge and dropped in. He was inside for about 4 minutes. When he came back out, he looked directly up at Hercules and let out a few piercing calls. She called back. He responded. Interesting. Finally, he took flight directly for her and landed on the ledge, approximately a foot from her. “Awww,” I thought, free-form anthropomorphizing and looking forward to seeing some affectionate preening or some other such behavior. Hercules flattened her body into a pecky torpedo and thrust her head at Max while stepping menacingly towards him. He screeched back at her, but held his ground. “Hmmm,” I thought, romantic anthropomorphic daydreams waning. As far as I could tell, they never touched, but they argued loudly over the space for the next few moments. Finally, Hercules took off and Max settled into her vacant spot. I got the above picture about an hour later. Hercules came in from the southeast with an unknown bird in talon. As soon as she got to the nest ledge, Max dropped down from the Monadnock ledge and landed next to her. 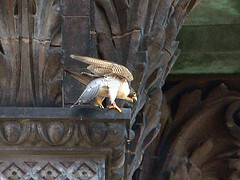 She dropped the prey, he took it and went into the nest, returning maybe a minute later and immediately taking off for the Monadnock ledge again. Hercules followed right behind him and contention for the ledge began anew. I snapped this picture of Max defending his position fiercely. Eventually, though, Hercules won. Max left for the skyperch. But, since I brought it up, I guess I should discuss the issue a bit here. Watching wildlife requires me to write down my observations in as cold and clinical a way possible. My field journal looks nothing like this journal, which I write for my own pleasure and to share with people who would be bored by the bare bones scientific observations. I can’t really help anthropomorphizing a bit as I watch Herc and Max. But, I have to try to keep it to a minimum. Animals do not behave in the same way we do (duh). Assigning human motivations to the falcons can cause me to misrecord behaviors. For instance. Look at the above anthropomorphized account. If I allowed it, my mind could imagine the squabble arising not from merely a territorial dispute but from an actual fight between the “husband” and “wife”. I might then go down causal avenues having more to do with how human mates relate to one another rather than how peregrine mates behave with one another. I could start seeing little things. A bird left messily on the ledge. Max spending too much time with the chicks. You see where I’m going with this? Pretty soon, I have a whole story that has absolutely nothing to do with peregrines, basically wasting my observation day. Okay, if we are so concerned with anthropomorphizing, why name them? Some people don’t. Mary and many others, however, realize that naming things is one way that humans use to relate to living things in their sphere. And, let’s face it, falcons are really hard to relate to. When we get a lunch break, we don’t run out the door, look for a cow and dive down on it at an alarming speed. We don’t then grab the stunned cow in our hands and hustle away to our lunch table to bite its head off before feasting on its innards. We go to McDonalds. Most human mothers don’t stand a ways off while their babies take their first step … off a 40 floor ledge. The falcons do some things better (in my mind) and humans do … other things. Anyway, the point is, falcons and humans are very different. But, the hundreds of people in buildings around these peregrine nests who watch them every day need some way to relate to these majestic birds. One way to relate is naming. Mary gets name suggestions from interested parties or gives the right to name the chicks to people who have been instrumental in helping us for the season. Sometimes, she and the banders simply like a name and give it to the chick in question. The names help everyone to feel closer to the falcons. It’s just how we humans are, I guess. And feeling closer translates into watching more carefully. Downed chicks are protected more readily. Injuries are reported. The end result? Everybody and everyfalcon wins. ~ by Steph on May 28, 2006.